Thanks to the CSA, I am accustom to the idea of only eating certain vegetables at certain times of the year. Asparagus? I ate my weight in it and now I don’t care if I see it again until next spring. Tomatoes? I’m about to do the same. There is always plenty and when the season ends I let it go quietly while stuffing my face with the next. I’m having a harder time with fruit. I love fruit. I’ve heard it said many times that fruit is mother nature’s candy. I know there are a few arguments out there against eating local but when it comes to fruit, a strawberry from the grocery store is no match for a strawberry that is picked right off the vine. I have a hard time with fruit because the seasons seem more erratic and I’m less likely to take home a giant pile of berries each week. Berries are also something I can’t plant every year and expect to bear fruit. They take commitment to be in a place longer than a year, for which I don’t have. When strawberry season ended I felt a twinge of regret that I only ate so many and now that I’ve moved on to blackberries, I have a sneaking suspicion I will feel the same way. I’m a bit greedy when it comes to fruit. Never the less, I have to enjoy what I have, when I have it. This crostata is fairly easy to throw together and would be perfect to take to a summer picnic or enjoy after an evening of grilling. I love mine slightly warm with a scoop of ice cream on top. Also, don’t be afraid of the lack of sugar. I’ve found that between the sweetness of the berries and the cardamom, the excess sugar is not missed. In a food processor or bowl, combine 3/4 cup pastry flour and 1/4 teaspoon salt. Cut cold butter in to flour until pieces are slightly larger than pea size. Mix in 2 tablespoons water and continue to add a bit of water until dough comes together. Place in refrigerator. 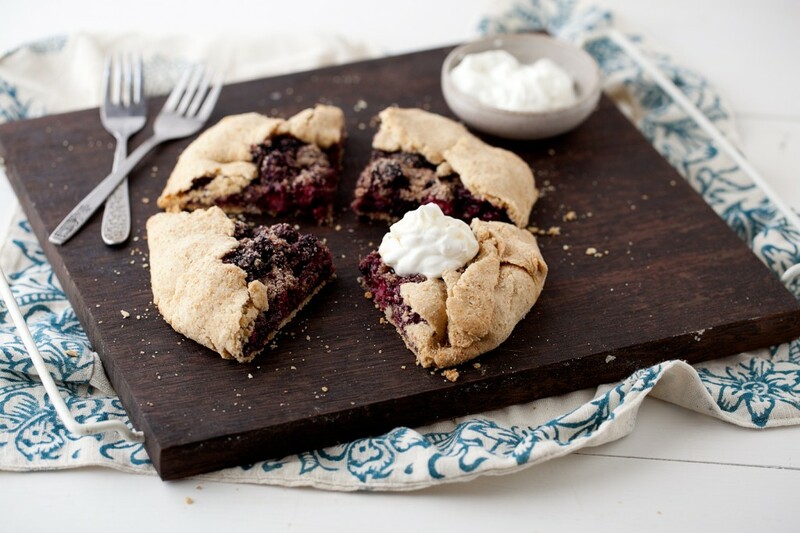 In a separate bowl combine blackberries, maple syrup, 2 tablespoons pastry flour, and 1 teaspoon cardamom. Stir until blackberries are coated. Once oven is ready, remove dough from refrigerator. On a floured surface, roll dough out to a 12″ circle. Transfer to a baking sheet. Place blackberry filling in center, leaving roughly a 2″ border. Fold outside edges over dough. Bake for 45-55 minutes or until crust is golden brown and berries are soft. Serve with yogurt or ice cream. This looks mighty tasty and fits my recent obsession with crostada and galettes. I have a big bag of frozen blueberries I may use up part of this way. I also like to hoard fruit but I usually think to buy a bunch at the farmer’s market and freeze it or make jam when the time has basically already passed and we are on to the next fruit. I’m a bit greedy when it comes to fruit too! Only I always end up wanting to eat it all straight from the vine/bush/tree instead of in baked goods. However, this crostata looks like a giant jammy scone, so I may not be able to resist! This is one of my favourite ways to use up some of summer’s bounty and is the kind of thing that I’ll happily justify eating for breakfast, lunch & dinner! Girl, I could eat my weight in fresh berries. EVERY. DAY. If I could just figure out a way to befriend a berry farmer who lets me …. I want a slice of that right now… love berries & cardamom. I’m with you on the sugar & berries thing… they’re so sweet already (plus I’d top it with ice cream too). i always wonder why people feel the need to add any sugar/sweetner to berry desserts – in my mind they are yummy just with fruit itself. love the addition of the cardamon to this one. This looks so incredible. Cardamom is one of my favorite spices to add to desserts. I’m with you on the berries. I tried growing my own strawberries this year with very little success. Gorgeous photos. I love how a simple spice can add so much more character to a dessert! I do enjoy the combination of blueberries and cardamom. This riff is something I could definitely get into… and the crostata is beautiful! This sounds positively lovely! Great recipe! Wow, you’re already getting sick of tomatoes? I just started getting them in my CSA box so they’re still a novalty. I must admit that I’m getting a little tired of some summer fruit already. I guess it’s just time to transition from cherries and apricots to peaches and nectarines…or blackberries! 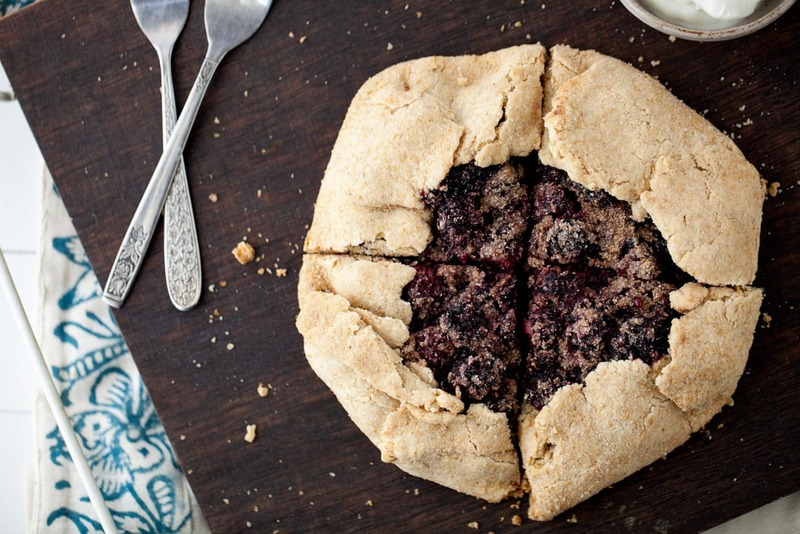 I haven’t had any of those yet this summer and I could certainly go for a blackberry treat like this crostata right now! This looks incredible. Blackberry + cardamom sound great together. We have a fence lined with raspberry bushes, and I have to say it’s one of the things I love best about our house. I just love summer berries. We end up eating most of them right off the plant, ha. But I may have to put them this lovely crust! I tried this, and mind you, I’m pretty new to making pastries in general (I was always a kitchen “mad scientist” of sorts who likes to add things as I went, rather than sort it all out ahead of time), but I had a little trouble. My crust was super, super flaky and crumbly. It was also pretty dry. I guess this might be how this pastry is supposed to be, but I was wondering if I could make it a little moister? Can I add sugar to it or perhaps a little egg? I’d like to get in to pastry stuff a little more and this recipe was good but my personal tastes want something a little less crumbly. Any thoughts you might have are immensely appreciated! Thanks Erin! This looks divine, I love blackberries and cardamom, never thought of pairing them!